San Diego is known to many as America’s Finest City, beloved for its endless miles of scenic coastline, amazing weather, top-notch restaurants, and friendly, laid-back attitude. It’s become a top destination for both homebuyers and businesses, and the region’s population is expected to increase by about 33% by 2050. However, the already-strained infrastructure currently in place is in no way prepared to support the expected growth. While it’s the second largest city in California and has some of the worst traffic in the nation, San Diego has inadequate public transit to meet the transportation needs of its growing population. The city recently received a failing grade for ozone pollution in the American Lung Association’s 2016 State of the Air report. Rising home and rent prices, low housing stock, and stagnant wages have created a rapidly worsening housing crisis in which 75% percent of San Diego County residents cannot afford a median-priced home. In fact, a recent study by Bankrate.com found that San Diego is the worst city in the nation for building wealth because residents are unable to put away savings. The situation sounds bleak, but sustainable growth is an attainable goal for San Diego if it embraces some real and permanent changes. For those not familiar with the concept, smart growth, also known as transit-oriented development (TOD), describes development of higher density housing types centered around public transit. It’s meant to create what some describe as a “city of villages”: convenient, walkable communities with housing offered at various levels of affordability that eliminate the need for personal automobiles for travel to jobs, businesses, and entertainment. The benefits of embracing smart growth are compelling: Decreased traffic levels would improve commute times, decrease pollution levels, and improve the health and well-being of San Diego residents. The added housing would provide much needed housing stock to a market with high demand and low supply, and help stabilize the out-of-control rent and housing price increases. As pointed out by smartgrowthamerica.org, financial benefits would include decreased transportation costs for individual households and decreased infrastructure maintenance costs for municipal government. Finally, the changes would satisfy the significant shift in preference of today’s homeowners and renters, increasingly comprised of the millennial generation, towards urban, walkable communities near transit. Unfortunately, despite the adoption by SANDAG of an extensive smart growth plan entitled the Regional Comprehensive Plan (RCP) in 2004, San Diego has failed to successfully implement smart growth policies throughout the city. A recent study by Berkeley School of Law’s Center for Law, Energy & the Environment and nonprofit research group Next 10 ranked San Diego’s trolley system as the worst in California, stating that San Diego came in dead last in its efforts to combat climate change and economic inequality. This is due mainly to development decisions that have prevented construction and development along transit lines. Smart Growth Concept Map from SANDAG’s Regional Comprehensive Plan, 2004. See entire map. Another hurdle to increasing development is zoning across the county, the majority of which does not allow for density high enough to provide a sufficient ROI to incentivize developers. According to findings from REAL Development, LLC, over 95% of development in the pipeline or completed in the last 5 years in the Downtown, Uptown, and North Park areas occurred at 109+ dwelling units per acre (DU/acre), a measure of density used for residential zoning. However, most of the city, including the potential smart growth corridors mentioned above, is zoned for significantly lower density, to the tune of 54-73 DU/acre. Low density land use policies that restrict returns on investment disincentivize new development and cause vacant, blighted, and under-used corridors in the city to remain that way. All is not lost, though. San Diego recently enacted several plans that are huge successes in the smart growth effort. SANDAG’s upcoming trolley line extension, the Mid-Coast Trolley Line, will finally bring a much overdue transit solution up the San Diego coast, connecting the downtown area to University City, considered San Diego’s “second downtown.” Adding this much-needed transit option between these employment and residence centers has the potential to greatly decrease traffic congestion between the two areas. 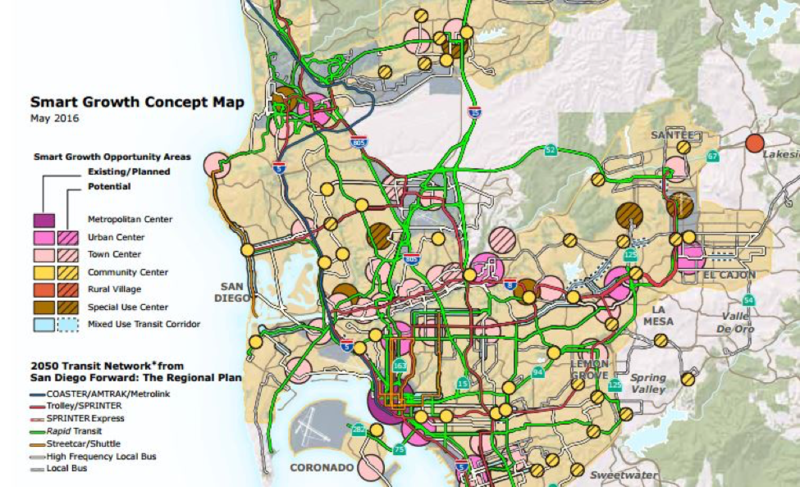 Additionally, the City of San Diego just presented a proposal for their “Downtown San Diego Mobility Plan,” which aims to add about 15 miles of protected bike lanes and pedestrian greenways to the core of the downtown area, promoting non-automotive means of transportation within the city. Some promising new trends in commercial real estate offer possible solutions in the form of alternative product. The housing crisis has led to the emergence of inventive housing types designed to address the need for affordable housing in urban areas. “Microunits,” tiny living spaces ranging in size from about 200-500 square feet, are more affordable than full-sized apartments and perfect for millennials for whom square footage is not a priority. Similarly, some developers are experimenting with “adult dorms,” private rooms centered around communal living spaces, with an aim to appeal to recent college grads who are new to the workforce. Businesses are also taking cues from millennials and beginning to relocate back to more urban, downtown areas. Employers note multiple benefits to being centrally located, including appeal to current and potential employees, proximity to fellow businesses, customers, and vendors, and the ability to nurture a more innovative, energetic culture. This is perfect for workers who prefer a short commute and will greatly increase the portion of the workforce able to walk, bike, or take public transit to work. The tide of public opinion also shows promising signs of change in more progressive areas like North Park, which is in the process of a community plan update that promotes new development and increased density in transit corridors like El Cajon Boulevard. Upon meeting certain criteria, such as innovative design elements, developments there have been allowed to increase density up to 145 DU/acre. Come summer, hundreds of millions of development dollars will be pouring into North Park. Local developer and entrepreneur Danny Fitzgerald has been a huge proponent for the changes and sees positive changes in the future. Says Fitzgerald, while we still need a major sea change on both the city and state levels, we are at the tipping point for a cultural shift, and if things keep progressing positively, we’re on track to curb the affordability crisis in 3-5 years. Perhaps the most important piece of legislation in the fight for smart growth, the Climate Action Plan (CAP), was approved by the City of San Diego in December of 2015. It involves a legally binding commitment by the city to cut carbon emissions in half by 2035. In order to do this, the city has no choice but to significantly reduce traffic congestion by providing alternative options for transit and reducing the need for longer commutes. Improve and increase public transportation in San Diego. Develop along transit lines. Developments need to be high-density and include a mix of affordability levels. Up-zone smart growth corridors, incentivizing development in these areas. Explore alternative housing options, like micro-units and communal housing, as possible housing solutions. Encourage companies to relocate to urban, downtown areas. There are many forces in favor of smart growth policies, and changes are slowly coming about. However, community resistance is and will continue to be a hindrance to the process until local residents begin to view these changes in the positive light they warrant. City legislators and community leaders must be proactive in their efforts to change public sentiment and highlight to the community how and why these changes will benefit us all in the long run. Density, done right, offers revitalization to our communities. It’s time for San Diego to live up to its moniker of America’s Finest City and become a healthier, savvier, and more affordable city.